I have just started to use AudioLabel 5.0 and created two CD/DVD-disc Label-templates, one with the inner-hole-diameter 22 mm and another with the inner-hole-diameter 17 mm and I have saved them as two template .aud-files. But when I start a new project and open one of these template-files, the latest created is opened, not the one which I click on to open. Why is it this way? I do not want to create new templates every time I am about to create a new label. You will have to create two separate custom label templates. You will only have to create these templates once. This is different than an .aud (project) file. From the 'Change Label Template' dialog, select your desired label template, edit the dimensions as necessary (e.g. 17 mm inner-hole diameter), and save the label template with a unique name. Then repeat these steps for the second label template (22 mm inner-hole diameter). When you open your .aud project file, be sure to select the correct custom template and AudioLabel will size them correctly each time. a) What do you mean by " This is different than an .aud (project) file"? I save the created templates as .aud.files using unique file names. What else? b) After editing a chosen template (inner hole diameter etc), the only save-option seems to be located at the upper right corner, "Save" and then "OK", and then the "Change Label Template-screen" is shown again and after chosing OK there, the edit-screen shows and there you can insert image, text and so on and then save the edited template. But when I do it this way, and open a saved 17 mm-.aud.template, the software opens the the latest created template (22 mm), which is saved with another aud-file-name. I don´t know what I´m missing. The .aud (project) file stores all of your text, images, etc. Whereas the 'Change Label Template' dialog controls the label/disc dimensions. So you will need to create two custom templates using the 'Change Label Template' dialog since you have two projects with different inner dimensions. From the 'Change Label Template' dialog, select your desired label template (highlight blue), click the "Create New" button, and an "Edit Dimensions" dialog will open. Set your desired dimensions (e.g. 17 mm inner-hole diameter), and save the label template with a unique name. Once you click 'Save' you will see your custom template added to the list of templates already provided. Then repeat these steps for the second label template (22 mm inner-hole diameter), being sure to select "Create New" in the 'Change Label Template' dialog. Once you click 'Save', you will see your 2nd newly created custom template added to the list of provided templates. Next, open one of your .aud files. Once the file is open click 'Change Label Template', and select one of your newly created templates. The design will automatically adjust to the dimensions of your custom template. "Next, open one of your .aud files. Once the file is open click 'Change Label Template', and select one of your newly created templates. The design will automatically adjust to the dimensions of your custom template." BUT: If I follow this and finally "open one of your .aud-files" and click "Change Label Template" it is not possible to "select one of your newly created templates". In the "Change Label Template"-screen there is no option "select a already created template". In this screen it is only possible to "Create new" and then "Save". 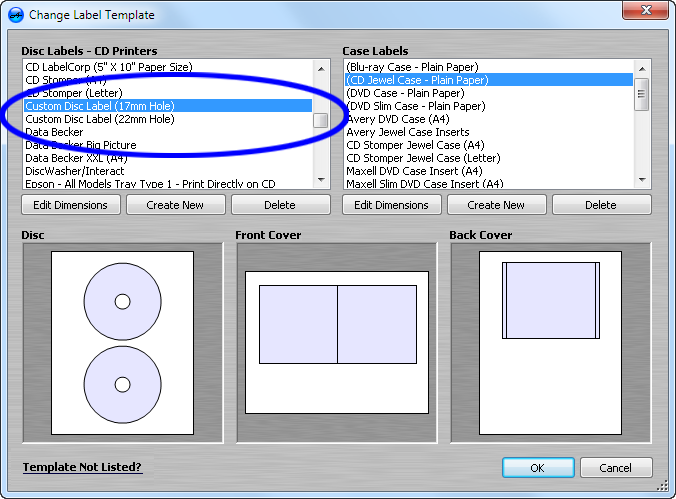 I suggest that you create a new "CD/DVD Disc Label-Generic"-template, inner hole 17 mm, and save it using a filenamn. After that you create another new labeltemplate, inner hole 22 mm, and save it using an other file name. After that you close the program and then open it again. Then you open ("File-Open") the 17 mm-template. Will the 17 mm-template be shown in the main screen? For me; no; the latest created template, the one with 22 mm-hole, is shown iin the main screen. Then, close the program, start it again and "File-Open" the 22-template. Will the 22 mm-template be shown in the main screen? For me; yes, that is, the 22 mm-template is the latest created. One would expect that when the program is started, "File-Open" is chosen and a saved template-aud.file is opened, that this aud.file is shown in the main dialog screen for editing there (text, insert image etc). But no, this is not the way it works for me. Instead the latest saved template-aud.file is shown in the mail dialog screen; not the one that I open. At least, the inner-hole diameter is the diameter of the latest saved template-aud.file, not the inner-hole-diameter of the opened template-aud.file. The dimensions of your label are controlled by the Change Label Template dialog. In the below example, I created 2 custom templates. First open your ".aud" project file, and then select either the 17mm or 22mm template (in the Change Label Template dialog) and your label design will adjust automatically. Yes, I discovered this and now everething is working. Thank you for your help.